David Letterman, G.I. Joe, naked Florida minister, Rapture Index, fake bacon crisis, iPhone 8: meh. Today is Wednesday, February 1, the 32nd day of 2017 in the Gregorian calendar, with 333 days remaining. 1,449 days until the end of Donald Trump's term as President, assuming he isn't impeached. Among other things, today is also G.I. Joe Day. 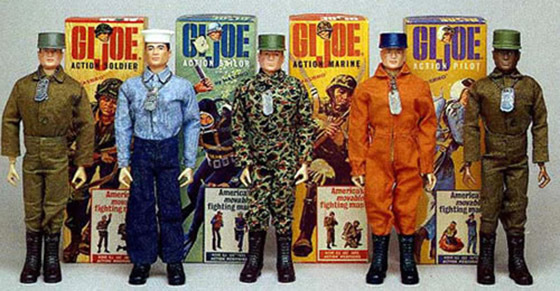 The toy was introduced by Hasbro in February, 1964. The KGB Quotations Database contains51,815 quotations. "I guess I'm just an old mad scientist at bottom. Give me an underground laboratory, half a dozen atom-smashers, and a beautiful girl in diaphanous veil waiting to be turned into a chimpanzee, and I care not who writes the nation's laws." If the Doomsday Clock isn't bad enough, there's also The Rapture Index. Panic! U.S. bacon reserves have hit a 50-year low. Don't panic! It's fake news. The new iPhone 8 is less than revolutionary. "Toffee-tastic is a bleak, flavorless, gluten-free wasteland." New Jersey Girl Scout cashes in on honest cookie reviews. The future of NOAA, the world's largest repository of climate data, is now in the hands of a climate-change denier. Remember that article last month about the ultra-rich buying property in New Zealand and taking other steps in order to survive catatrosphic events? Is it a smart undertaking or a dumb hobby?